The Federal Housing Finance Agency (FHFA) today announced the maximum conforming loan limits for mortgages to be acquired by Fannie Mae and Freddie Mac in 2019. In the county of Santa Cruz, the 2019 maximum conforming loan limit for one-unit properties will be $726,525, an increase from $679,650 in 2018. For areas (like Santa Cruz) in which 115 percent of the local median home value exceeds the baseline conforming loan limit, the maximum loan limit will be higher than the baseline loan limit. HERA establishes the maximum loan limit in those areas as a multiple of the area median home value, while setting a “ceiling" on that limit of 150 percent of the baseline loan limit. Median home values generally increased in high-cost areas in 2018, driving up the maximum loan limits in many areas. The new ceiling loan limit for one-unit properties in most high-cost areas (such as Santa Cruz) will be $726,525 — or 150 percent of $484,350. The Federal Housing Finance Agency regulates Fannie Mae, Freddie Mac and the 11 Federal Home Loan Banks. These government-sponsored enterprises provide more than $6.2 trillion in funding for the U.S. mortgage markets and financial institutions. Rates for mortgages in conforming range are normally about 0.25% better than High Balance mortgage rates. Both conforming and high balance loans (compared to Jumbo Loans) are regularly easer to qualify for, more forgiving if borrowers do something they should not (for example cash deposits or acquiring new debt) and usually carry less restrictions on property compared to Jumbo loans. Here is a quick comparison along with the breakdowns for the surrounding counties. Please feel free to reach out to our Santa Cruz Home Loan Advisor for any specific questions. 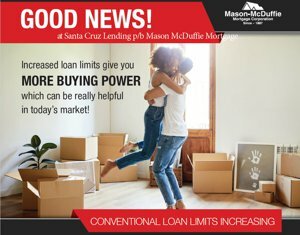 These new increases home home loan limits will help many buyers of Santa Cruz Real Estate achieve their dream of home ownership.